The article does a good job highlighting the fact the countries throughout the world have worked to lower their corporate income taxes since the early 80s, except, of course, the United States, which still stands at a rate of 39.1 percent, the highest statutory rate in the OECD. “The U.S. has the highest combined corporate tax rate of all OECD nations, at 39.1 percent, but it wasn't always this way. That rate, which consists of the federal rate of 35 percent combined with average state rates, is in fact low by historical standards. Throughout much of the 1950s and 1960s, the top federal tax rate for U.S. corporations was over 50 percent, placing America in the middle of the pack among OECD countries. It was only in the 1980s that the rate came down to the mid-30s range that corporations enjoy today. It also describes the reason for this worldwide decline in tax rates. In a globalized world a country can no longer punitively tax corporations. Capital is increasingly mobile, so corporations are able to place their operations wherever they please; something that was not as easy 20 or 50 years ago. 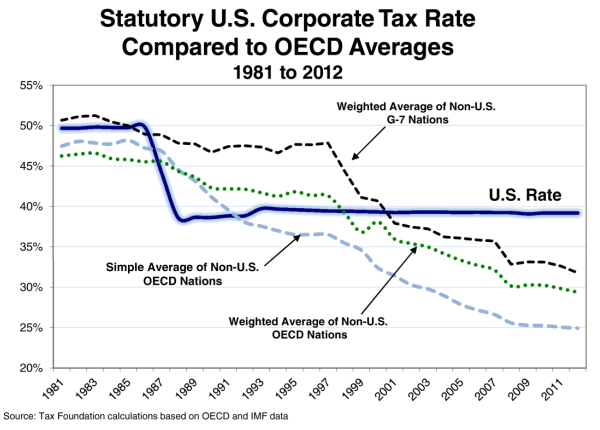 However, the article goes off base with its discussion of effective corporate tax rates. The article correctly points out that although the United States has a corporate income tax rate of 39.1 percent, not all corporations pay that. The United States’ effective tax rate is lower for numerous reasons. To make this point, though, the article cites the recent GAO report that found an effective tax rate of 12.6 percent on corporations’ worldwide profits. Besides having a faulty methodology that does not even correctly define the proper tax base in the 12.6 number, the report is far out of line with most academic literature on the subject. It is even out of step with prior GAO reports on the same subject. With a little more research, the reporter would have seen the numerous studies out there that show a more accurate representation of what the effective corporate tax rate is for U.S. corporations. Our report from 2011 makes this especially easy. 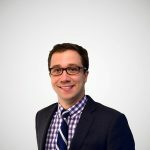 This paper reviewed the literature on this subject and found that corporations paid average effective rates that varied from 23 percent to 34 percent, depending on methodology used; rates much higher than the outlier report from the GAO. Even more, the article misses another important point. Although our effective corporate is lower than our statutory rate, this holds true for most OECD countries. Our 2011 paper also found that our effective tax rate averaged 7 percentage points higher than the OECD average across all studies. So even though our effective rate fairs favorably against OECD statutory rates, it is another story when you consider all countries’ effective corporate income tax rate. I am glad that the United States’ position as a laggard in corporate tax reform is getting media attention. However, it is important that this discussion include the whole story on corporate taxation. It does not serve to inform the debate if important pieces of the story are skewed or missing.